Rain or shine, awning windows allow you to ventilate your home with healthy fresh air. Renewal by Andersen awning windows are the highest quality available, utilizing advanced materials and manufacturing techniques that could only be performed by a renowned company like Renewal by Andersen. Awning windows open from the bottom and protrude outwards from your exterior walls. The window itself protects the interior of your home from penetrating water, allowing you to keep them open during a fresh summer rain. Each Renewal by Andersen awning window is equipped with a customizable h and crank, and with just a few turns of the crank your awning windows can open up your home to cooling breezes or seal it tight against the elements. Here at Renewal by Andersen of St. Louis, local homeowners generally ask us to install awning windows in areas where wall space is in short supply. Awning windows are easily positioned around furniture and cabinets, and are easy to reach. If you need multiple awning windows installed, our design team can create a unique vertical, horizontal, or custom configuration in your home. With the ability to add ventilation and aesthetic appeal to the more high traffic rooms in your home, awning windows can be a valuable investment. Be sure to make that investment in a company like Renewal by Andersen of St. Louis, a company that truly underst ands the challenges and rewards of owning a home in the St. Louis area. To learn more about our sliding windows, give us a call or fill out our Request an Estimate form to schedule a FREE in-home consultation with the leading experts on replacement windows in St. Louis- Renewal by Andersen of St. Louis. 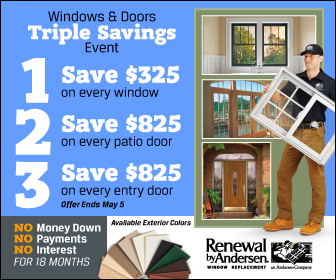 If you live in or around St. Louis, you have only one choice for the highest quality doors and windows- Renewal by Andersen of St. Louis. Give us a call today at (314) 332-2364 to start on the path towards a brighter, more valuable home.